At nine meters (30 ft) in length, Triceratops was among the largest ceratopsians and one of the last to become extinct. It made up the bulk of the plant eating population just before the end of the Cretaceous. Its remains are particularly common in coastal lowland sediments. 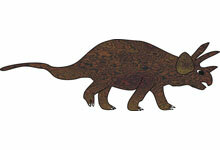 Triceratops had a single, short nasal horn and horns as long as hockey sticks protruding above its eyes. Its head, sometimes as much as three meters (10 ft) long, was the largest ever possessed by a land animal. It had large eyes and a relatively large brain. Triceratops was probably a feisty animal. Many specimens have bones damaged in combats with rivals or predators. Triceratops remains were first discovered near Denver, Colorado, in 1887. At first they were identified as the remains of a recently extinct species of buffalo.